Oxford Place supports the health and well-being of its tenants by creating an environment that promotes personal success through innovative health and wellness programs. 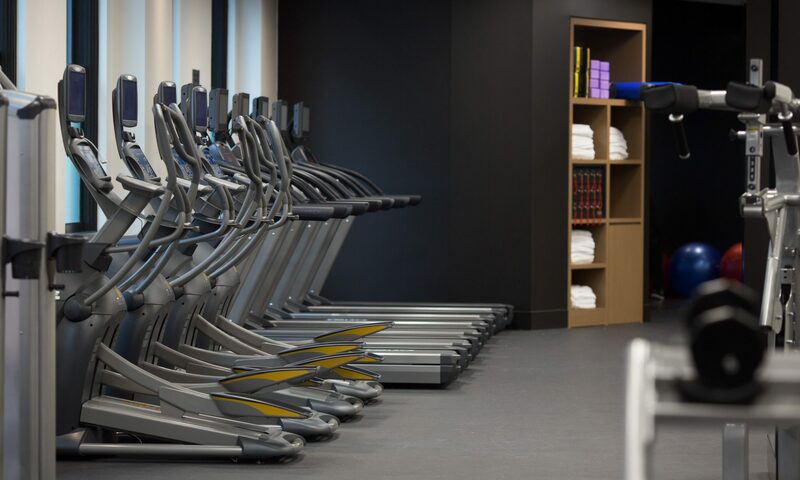 Memberships to any of the facilities are exclusive to tenants working within Oxford Place (Marine Building, MNP Tower, Guinness Tower and Oceanic Plaza) and access to the facility is restricted to tenants only. The bike facility offers secured, fob access bike parking, bike lock mounts, repair station, air pump, and change rooms. For added security and comfort, the facility boasts one of the first custom executive bike rooms in Vancouver with a cedar lined compartment for your clothing to keep your wet items separated from your bike. Click here for to see the executive bike locker. The bike facility is located on the lower main level of Guinness Tower. An activated access card is required to enter the bike facility. To book a facility tour please contact Jason at jmcwhinnie@oxfordproperties.com. Please click here for the waiver forms. We offer the below options of cycling memberships to suit your needs. There are three (3) secured bike storage rooms including a larger overflow room, all equipped with fob access security. 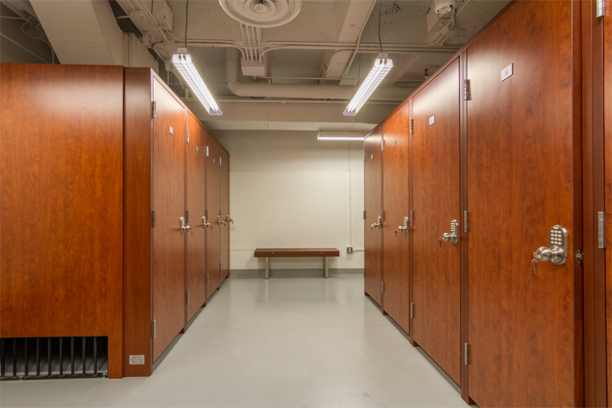 Each storage room provides inverted u-style bike racks, vertical well mounts, and bike lock mounts. The overflow bike storage room has a tire pump and a bike repair stand with a range of tools as well as a dryer for those who opt not to have access to the change rooms. Locks are not provided. To activate your security card for bike storage access, you will need to complete the Waiver Form. The men’s and women’s change rooms were designed with the cyclist’s use in mind. In order to obtain a membership to the Guinness Tower change rooms you will need to complete the Bike Facility Access Form. Once your form have been submitted and processed, access will be activated on your building security card. Day lockers are labeled and are available to all members at no charge; items must be removed at the end of the day. These custom made lockers are designed to hold one bike each along with bike gear such as panniers, locks, lights, etc. A separate cedar lined compartment can accommodate a full dress suit and provide separation from the bike and gear storage area to keep your clothing clean and free from debris. This fee includes access to the change rooms. Contact Joslynn (info@oxplacewellness.ca) for locker availability. The bike facility is open 24 hours a day, 7 days a week including statutory holidays, accessible only to tenants who have been granted access. All classes are offered on a fee basis. Pre-registration is required (no drop-ins) and a minimum number of registrants are required to run classes. All classes can be paid via cheque, cash or E-Transfer and are non-refundable/non-transferable. For more information on fitness classes, or to register, please contact Erin Olmstead (erincolmstead@gmail.com).